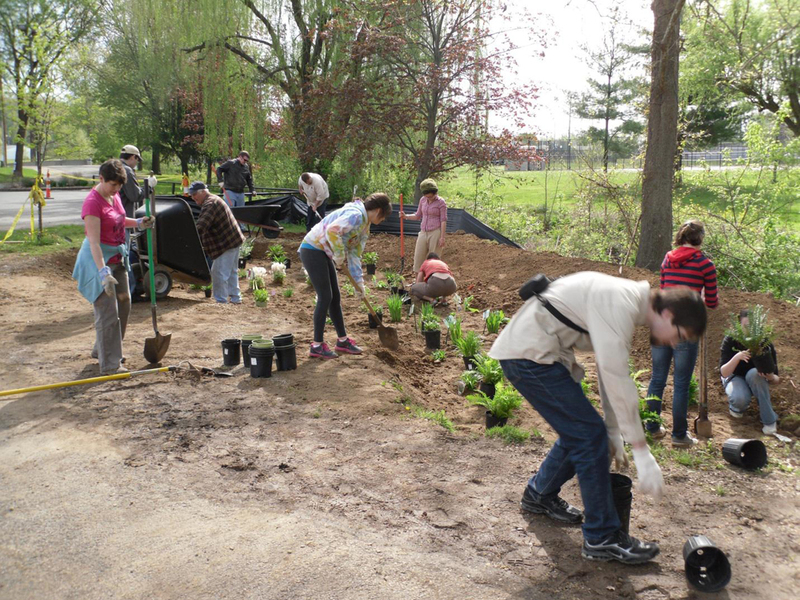 Friends of Lower Muskingum, a conservation group dedicated to upholding the water health of Ohio’s Muskingum River, was looking to install a rain garden on the campus of nearby Marietta College. Andy Long, a graduate student at Ohio University, was looking for a thesis project. So they joined up, along with the college, to make it happen. The conservation group paid for the soil amendments. Marietta College covered a backhoe needed to dig the garden. Long, who is pursuing a master’s in civil engineering, won a grant from the Ohio EPA’s Environmental Education Fund to purchase monitoring equipment and headed up planning the garden. Placing the plot in the right spot wasn’t difficult because heavy erosion in a grass area near the one-acre lot, close to the college’s Hermann Fine Arts Center, showed exactly where the runoff was flowing. The composition of a rain garden will vary, Long says, depending on what’s underneath it. The area he was working with had high levels of clay in its soil, so his plan had to contain steps for removing and replacing it. His garden design was meant to sustain consecutive rain events because the area commonly experiences flash flooding. Goose Run Creek, he says, can go up and down many times each day. From there, Friends of Lower Muskingum put on a workshop for members of the community to learn about the usefulness of rain gardens. Those attending helped finish the rain garden’s construction with mulch and native plants. Vegetation native to the area is more successful in the long run because it will flourish with ease and spread out to give the garden stability. Long monitored the garden’s runoff for a year, relying on ISCO water samplers, a tipping bucket flow gauge and Solinst Leveloggers. The flow gauge helped him track water’s inflow and outflow to the garden while the Leveloggers measured how fast water would pond on top of the rain garden. The two samplers helped Long evaluate for total suspended solids and heavy metal content. His findings, he says, were no surprise. “The rain garden is reducing TSS (total suspended solids) loads by 90 to 98 percent through the garden,” said Long. “It’s very effectively delaying runoff.” His analysis of metal contents are not yet complete. With the preliminary data he has, Long wants to estimate rain gardens’ potential to reduce flash-flooding and total suspended solids throughout the Goose Run watershed.